It was just one wonderful treat after another at the NYFOS Gala at Weill Recital Hall last night. The packed house was the right audience for the generous selection of songs by Stephen Sondheim with the illustrious Steven Blier at the piano, charming the audience with tidbits about each song and the show from which it was drawn. As is customary with NYFOS events, there is no boundary drawn between types of songs and who gets to sing them. The best part about these evenings, beside Mr. Blier's delightfully witty narration, is that the music is sung by superb singers in their natural unamplified voices. This strengthens the assertion that there are only two types of songs--the good and the bad. Mr. Blier chooses the good ones; they tell us stories. Stephen Sondheim is inarguably the best composer of musicals of our time. The astuteness of his lyrics and the complexity of his music never ceases to amaze. There is no subject he has been afraid to tackle--not even assassinations and cannibalism. It is hard to say which is our favorite show but A Little Night Music and Sweeney Todd are both right up there at the top and were well represented last night. The program opened with "Two Fairy Tales" which was written for the former show but somehow never made it. Performed by Meredith Lustig and Theo Hoffman (of the Los Angeles Opera). it involved a kind of "she said-he said" situation with ironically contrasting and alternating lines. The two artists were completely delightful. Ron Raines and Pamela Myers were similarly delightful in the waltz "You Must Meet My Wife" with Ron as Fredrik, waxing rhapsodic over his (surprise!) virginal bride and Pamela as Desiree cracking wise. Sweeney Todd was well represented with the too-clever-by-half "Have a Little Priest", with Greer Grimsley as the eponymous Sweeney Todd matching rhymes with Luretta Bybee's Mrs. Lovett. What incredibly adroit wordplay! Ms. Bybee got to sings Mrs. Lovett's romantic fantasy "By the Sea", and the forceful "Epiphany" was given a powerful and dramatic delivery by Mr. Grimsley. The show also had a tender ballad in which Tobias sings "Not While I'm Around" in which he expresses his protective caring for Mrs. Lovett. Mr. Hoffman sang it with appropriate depth of feeling. And yet another duet "Pretty Women" sung by Mr. Raines and Mr. Grimsley. Follies was represented by Ron Raines singing Ben's song "The Road You Didn't Take". It made us wish to see a revival of the show which we have never seen. We never saw Evening Primrose either but "Take Me to the World" was quite moving as performed by Ms. Lustig and Mr. Hoffman. A song from Company was performed by Pamela Myers who originated the role of Marta, a woman who is in love with New York City. "Another Hundred People" captured all the energy and vitality of our city. And there was a song about the beach as well--"The Girls of Summer" from Marry Me a Little, winningly performed by Ms. Lustig. Not every Sondheim show was a smash hit and Road Show was re-written a number of times, never achieving great success; but it did contain a wonderful song called "Talent" in which the character Hollis Bessemer expresses his dream of creating an artist's colony in Palm Beach. Mr. Hoffman's performance was superb. The evening ended with the entire cast joining Ms. Myers for Hattie's song "Broadway Baby" from Follies. It was a superfine evening that we wished would never end. 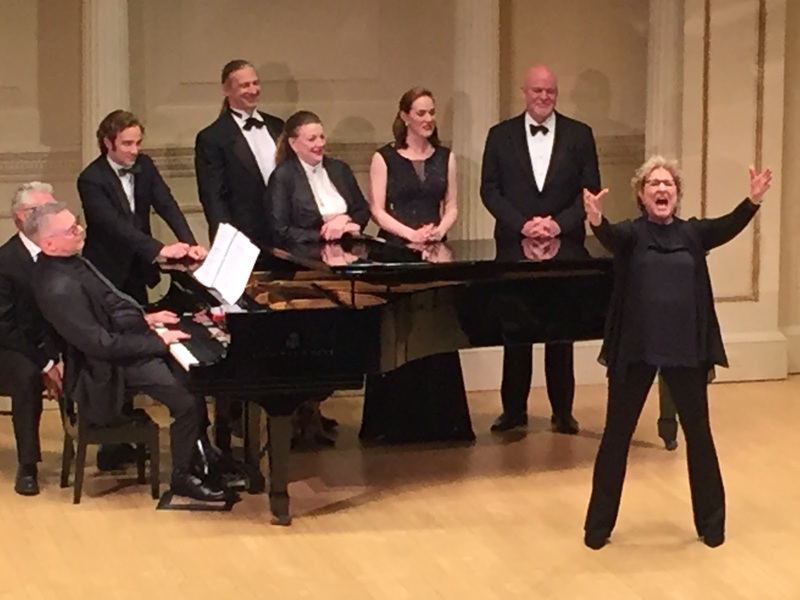 We could have listened to Sondheim songs all night!